Darrell Wyatt / Getty Images. The Columbia River Highway was one of the first US highways designed for scenic touring. The first section, which runs between Portland and The Dalles, originally opened in 1915. When completed in 1921, the 350-mile highway went from Astoria to Pendleton. Various sections of this historic highway - US Highway 30 - have been preserved, with about a 20-mile-long portion still available to automobiles, and other sections available to bikers and hikers. The western drivable section, which runs from Troutdale to Multnomah Falls, should not be missed. The Historic Columbia River Highway winds through temperate rain forest, a wonderland of conifers, maples, wildflowers, mosses, and ferns. It runs through the lushly-forested hills that are located above Interstate 84, which is now the primary highway through the Columbia River Gorge. As you travel the old highway, you'll be treated to a lush green landscape, waterfalls and moss-lined canyons, and intermittent river views. 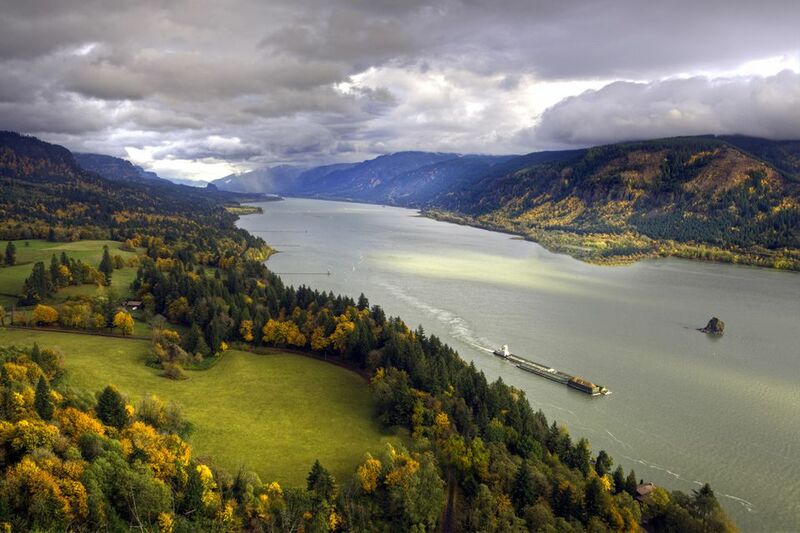 You'll want to stop often along the way to check out scenic viewpoints, to hike to and around grand waterfalls, and to take in the beauty of the Columbia River Gorge. Much of the land along the historic route has been preserved under various units of the Oregon State Parks system or as USDA Forest Service land. In keeping with the beauty of the surrounding, the Columbia River Highway builders made sure that the man-made structures along the road were equally beautiful. You'll see lovely stonework and concrete arches along your driving tour, the remains of the historic highway's original safety rails, turnouts, and bridges large and small. There are dozens of waterfalls along the Columbia River Gorge and the section encompassed by the Historic Columbia River Highway includes some of the best. Many, including spectacular Multnomah Falls, can be seen from the road. While there is much to be seen from the roadside, you'll definitely want to get out and explore the lush green landscape along the historic highway. You'll find hikes ranging from easy paved interpretive trails to challenging uphill treks. A good place to start your trip is with a stop at the Troutdale visitor center. As you enter this small town, located at the west end of the Historic Columbia River Highway, you'll see a sign arching over the roadway that reads "Troutdale: Gateway to the Gorge." The visitor center is located on the south side of the road near this sign. You'll be able to pick up maps and learn more about current conditions along the scenic route. 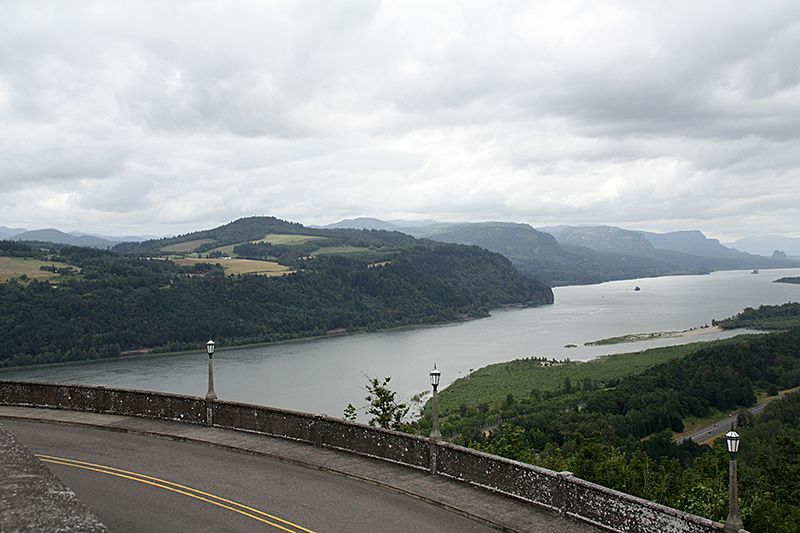 Officially called the Portland Women's Forum State Scenic Viewpoint, this stop along the Historic Columbia River Highway offers one of the most stunning gorge views. This bluff overlooking the river was named "Chanticleer Point" by an original owner, who built the "Chanticleer Inn" on the site in 1912. The inn later burned down. The Portland Women's Forum, a local civic organization, purchased Chanticleer Point during the 1950s for the specific purpose of preserving the viewpoint from commercial exploitation. A stone monument devoted to Sam Hill is located near the entrance to the viewpoint. Drive past and you'll find ample parking as well as picnic sites. Sam Hill, along with Samuel Lancaster, was an important figure in the development of the Columbia River Highway as well as a significant contributor to the Pacific Northwest's infrastructure development. Walk to the end of the drive for one of the most spectacular views in the world. Lovely stonework frames the plaza that is oriented to take in the view. Not far to the east you'll see the Vista House at Crown Point, a charming and distinctive stone structure. Behind that, the wide mouth of the Columbia River is embraced by massive rock formations and green forests. Interpretive signs share the story of the ice age floods that shaped the Columbia River Gorge and explain the highway builders' vision. Among the many superlative viewpoints along the Columbia River Gorge, Crown Point is one of the best. Vista House, with its hexagonal stone structure, stained glass windows, and domed tile roof, is as lovely as the surroundings. Originally built as a rest area along the Columbia River Highway, Vista House is a must-see stop for several reasons. Inside you'll find a gift shop, restrooms, and refreshments. A staircase takes you to the upper-level viewing deck, where you can enjoy a new perspective on the incredible view. Vista House also serves as a museum, offering artifacts, historic photos, and interpretive displays addressing the unique geology of the Columbia River Gorge as well as the highway's construction. The lands around Crown Point and Vista House are preserved by the state of Oregon as Guy W. Talbot State Park. Park facilities include picnic tables and trails. The stretch of road both east and west of Vista House includes much of the original stonework, adding to the scenery. LaTourell Falls plunge almost 250 feet over a cliff face composed of basalt columns. While you get a fine view of the falls while driving across the bridge over LaTourell Creek, you'll want to stop to explore the nature trails and to take in the variety of fall views. A short, steep, and fairly easy trail leads to the base of the falls, where water tumbles through the rocky creek, surrounded by lush rainforest greenery. If you're feeling more ambitious, a two-plus mile loop trail leads to the upper falls. Sections of this trail can be narrow and rocky. Like Crown Point, the LaTourell Falls lie within Oregon's Guy W. Talbot State Park. Park facilities include not only parking and trails but a picnic table shelter and restrooms. The waterfall at Shepperd's Dell is a two-tiered falls that cascades through a narrow canyon; the upper falls fall about 40 feet and the lower falls plunge down an additional 50 feet. The bridge over Shepperd's Dell is particularly striking, with stonework railings and graceful arches. While you can catch a peek, you can't get a good look at Shepperd's Dell Falls from the road, so you'll definitely want to stop at this one. Parking is available in the roadside turnouts. From there you can take a short walk down to a viewpoint at the pool between the upper and lower falls, which also affords a great look at the historic bridge. A stop at Bridal Veil Falls offers plenty of opportunity to stretch your legs as you take in both falls and Columbia River scenery. The falls themselves have two tiers. The longer upper Bridal Veil Falls plunge down almost 80 feet, while the lower falls cascade down another 50 feet. A half mile steep downhill trail leads to a wooden overlook at the base of the falls. This stop, on the river side of the road, includes a forested park with open lawns and picnic tables, making it a great spot for a family outing. You'll also want to spend some time exploring the Overlook Trail, an easy interpretive loop that leads to views of massive basalt formations standing above the Columbia River. You'll get a good look at the 242-foot Wahkeena Falls both from the road and from the parking area. The ease of access to these lovely staircase falls will give you a taste of what's in store if you're feeling adventurous. From Wahkeena Falls you can access a network of trails leading to Upper Wahkeena Falls as well as several others, including Necktie Falls, Fairy Falls, Multnomah Falls, Double Falls, and Dutchman Falls. The most famous and photographed of the Columbia River Gorge waterfalls, Multnomah Falls is a grand two-tiered falls. Upper Multnomah Falls plunges 542 feet into a pool surrounded by mossy boulders. The waters then cascade down an additional 69 feet. A paved uphill hike leads 1/2-mile from the plaza behind Multnomah Falls Lodge up to the Benson Bridge, which overlooks the base pool of the upper falls on one side and the top of the lower falls on the other. More trails branch off from the Multnomah Falls area, connecting to the same system of trails that leads to Wahkeena Falls, Oneonta Falls, and Horsetail Falls. You'll find several different facilities and services at this historic stone day lodge. A visitor center offers exhibits covering the natural and human history of Multnomah Falls and the Columbia River Gorge. Forest Service rangers are on hand to advise you with hiking maps and trail conditions. There is also a well-stocked gift shop within Multnomah Falls Lodge that offers books, souvenirs, and gift items. Public restrooms are available in the lodge. Breakfast, lunch, and dinner are available in Multnomah Falls Dining Room, where you might sit in the rustically-elegant fireplace room, the window-framed atrium, or on an outdoor patio. The menu features Northwest ingredients as well as Northwest wines and microbrews. If you're looking for something more casual, snack stands outside the lodge serve fast food and sweet treats. While most of the Historic Columbia River Highway's waterfalls are west of Multnomah Falls, there's still more to check out east of that major tourist stop. The falls located closest to the road include Oneonta Falls and Horsetail Falls. You'll need to hike in and up to see Lower Oneonta Falls, which is a 60-foot plunge falls. Additional hiking will bring you to the Middle and Upper Oneonta Falls. Just over another mile of trail leads up to Triple Falls. Some people choose to walk/wade the stream up Oneonta Gorge to take in the unique plants and rock formations from a particularly lovely perspective. Lower Horsetail Falls can be seen from the road, while a 1/2-mile hike will take you to the Upper Horsetail Falls. The Horsetail Falls and Oneonta Falls trails connect at Upper Oneonta Falls. A section of trail closer to the highway connects this trail system with Multnomah Falls.